I would like to find the best way to filter 2 cubic meters of water which is full of water-based paint. This water is used in a closed-loop circuit in a Spray booth. The water does not need to be drinkable but just clear. The recycling company comes twice a year to pump out the 2 cubic meters of dirty water. If I could find a filtering system, they could just pickup for example few kg of semi-dry paint/mud. We are based in Asia, the solution needs to be easy to implement and cheap. Recycling company make you pay per kilograms of waste. 2 cubic meters makes 2000kg... If I would somehow filter the water and get the dry bits, I would pay much less. I consider few options : Using steel drums to make whool or sand-based filtering system. (Either with a pumping system which would run once a week, or by manually filling them). Using belt press filter or press filter (they are widely used in the process of converting dirty water, to semi-dry sludges). In my case it is to expensive to buy this machine, just to use it once a year. The solution of my problem will be some DIY genius. The whole point if to keep the water as clear as possible for the longest time before the company comes to pump it up. Moz suggested in his answer to use some clothing, as he was doing in his company. see comment below. I tried the filtering system with mesh wire and clothes suggested by Ӎσᶎ. Unfortunately it did not work, the dilution between paint and water being very high. I tried Moz solution again today with 10 gallons tank (big water tank for water fountain). At the neck, I putted 6 layers of clothes. Filled the tank with water : just went through. Even if I made the opening smaller with a valve at the end. Then I switched for 6 layers of silk (used to print logos on wood). Same result. 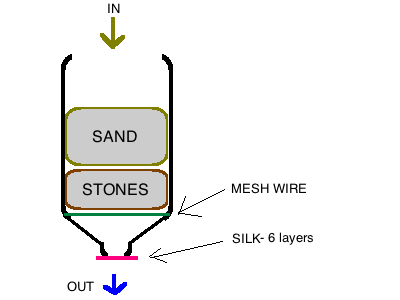 Then I kept the 6 layers of silk at the end of the bottle, Added a mesh wire inside and some stones. Finished with some sand. The flow was completely blocked, the sand was stuck in the neck of the bottle... therefore no throughput. I think it is because the sand can go through the mesh wire. Tomorrow, in the inside I ll swap the mesh wire for silk (sand does not go through), and it might work much better. The very low (nonexistent) throughput could be because I am experimenting on a small tank -> not much pressure. 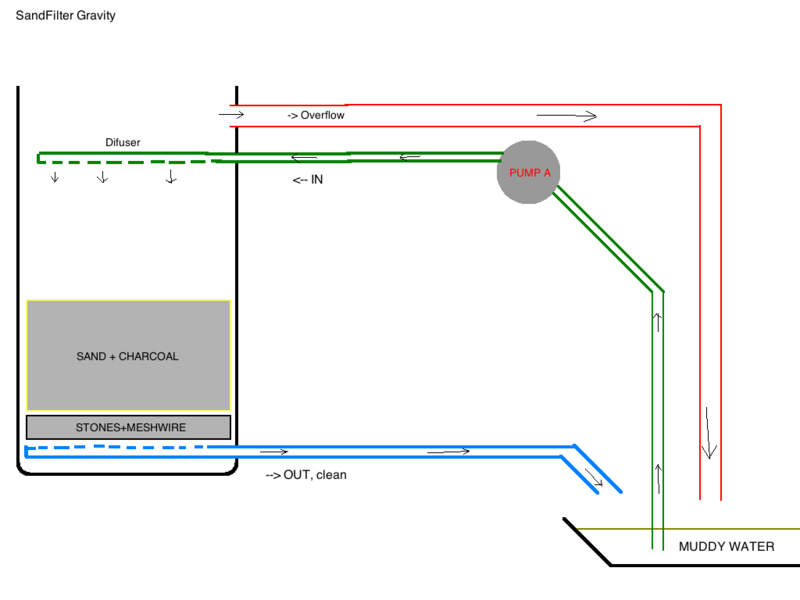 See schematic above, its a classic gravity filter. I made three different designs of filters, with gravity, pump and pressurized. I would like to get your advices about it. 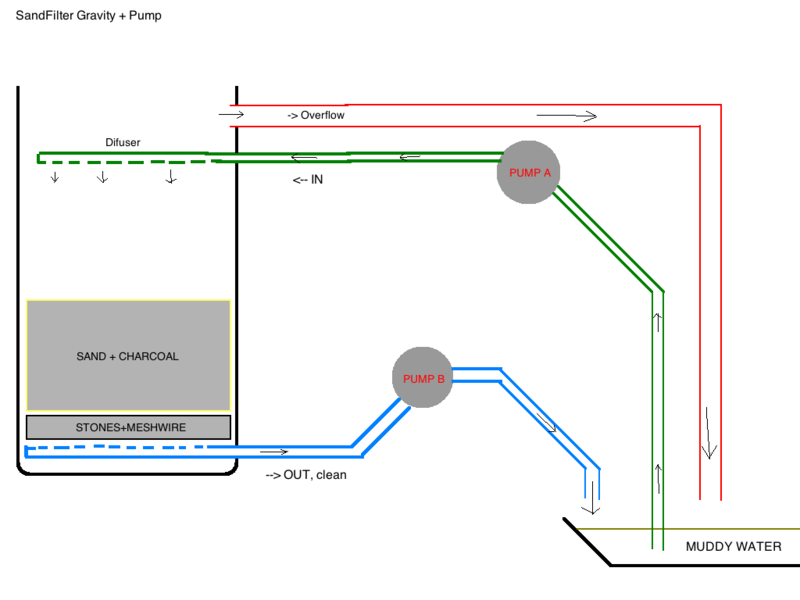 Even if its not drawn, all the pump have valves in order to regulate the throughput. The problem of the filter below is that the pump has to stop sometimes to prevent overflow... Is is a slow solution. But once again, I will run the filter only few times every 6 months. So why not. For the filter below, since its pressurized, maybe the sand level should be higher ? Thanks for your help, I will keep you up to date. I've worked in screen printing using water-based inks, and all we did there was a settling tank and cloth filters. By cloth, I mean we printed t shirts and used scrap t shirts to make the filters - just wrap 3-4 layers of t shirts around a screen printing screen and that's the filter (6-8 layers of cloth, one layer of ~0.5mm mesh). We had effectively a split tank with the filter at the top of the separating barrier, so water flowed through the filter into the "clean" side. It definitely was never drinkable, the hydrocarbons from the inks stayed in the water and made it smell bad forever. I found the settling tank did 90% of the work, what was left was very fine ink particles and some floating debris. The cloth filter got that out very effectively, and we changed that when it was obviously holding the water back - the level on the "clean" side was much lower than on the dirty side. Or when we had a pile of discarded t shirts. I'd just roughly cut the sleeves and printed front off, then use the clean back sections on the filter. Our system was smaller than yours, our tank was only about 300 litres. But if you already have a 2 cubic metre tank and can get another one I suggest trying a setup like the one we used. Put the "clean" tank a little lower than the existing dirty one, have the overflow from the dirty tank run over/through the filter, and see how it goes. If you're using cloth I suggest a frame with cloth resting on wire mesh, so it's easy to see how clean the cloth is and change it when required. Make sure the overflow from that filter is able to take the full flow out of the dirty tank, because the filter will get blocked at some point. When the settling/dirty tank got too full of "gunk" that had settled out we would drain most of the water out using a syphon, then when the siphon was sucking up dirty water we'd stop it and dispose of the rest. We usually let that build up until it was about half full - so there was only ~20cm of water on top of 20cm of sediment. 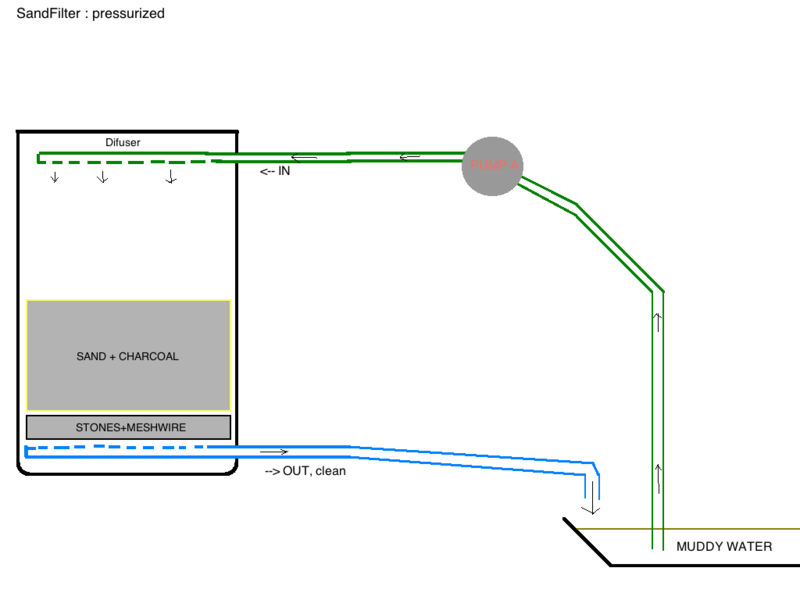 Regarding Distillation, the most efficient sea-water distillation plants need 23-27 kWh/m³, a small scale batch system will probably be far worse. Distillation plants are also pretty expensive. You mentioned a few option that might work, that is centrifuge, sand bed or coal filter. I suggeste taking a largish sample of your water and doing bench scale tests with each sand bed and coal filters. I also would try to let the material settle - just leave a batch undisturbed in a clear container for a few days or weeks, and see if the material settles. If it does, a centrifuge might work - or you simply build a settling tank. But I think you need to start with experiments, those will tell you more than the internet ever can. You are trying to separate the paint from the water. This is difficult since the paint particles are very very small. (sub micron). You may be able to do this with ceramic filters, but I suspect that the filters will clog so fast, that instead of shipping off 2000 kg of water, you will ship off 2000 kg of filters. Why not evaporate the water? Put a batch in a large shallow pan with enough roof to keep off the rain. Let it dry. Keep adding water. At some point, you let the pan dry completely, scrape what you can out of it, and start again. Even in Alberta our ponds are subject to about 4 feet of evaporation per summer. Two square meters of evaporation trays would only need to evaporate 1 meter of water over the course of a year. Indeed: If you make something like a swamp cooler, you may be able to get a degree of air conditioning out of it too. If your climate is too hot, then you need to raise the temperature to get the air dry enough to make evaporation happen. Paint the bottom of the tray black. OR put several layers of black plastic screen wire suspended above the bottom of the tray. The latter will be easier to clean off, and keep the bottom black. Insulate the bottom of the tray. The insulation can be high tech foam plastic, or it can be a few old blankets folded up. Put up reflectors to put more sunlight on the tray. Another method of dealing with the waste water is to use it to water ornamental plants. The paint will eventually affect the soil, but I'm assuming you aren't using pigments with lead or cadmium in them. Many paints use mineral pigments. (E.g. TiO2 is the most common white pigment used now.) Mineral pigments will do little harm to potted plants. You may eventually have to discard the soil, but I bet that a plant in a 5 gallon pot can use a good fraction of a cubic meter of water in a year. This is easy, but it means additives and process. 1% Ferric Sulphate or Ferric Chloride w/w, 5% lime solution w/w (50grm/ltr solution, 1.5% Bentonite solution (50gr/ltr solution), 1% Perlite body aid w/w. Some are wary of Ferric Chloride due to it's corrosive nature and other wary of Ferric Sulphate due to it's sulphate increase in the exit filtrate. Mix lime first with waste paint, then ferric chloride, then wait a few minutes for pH reactions to settle. Mix in Bentonite solution and then Perlite last. Mix well with low shear action. Pump through a filter press and you'll get approximately 25% residual moisture in the collected solids with very clear exit filtrate. You'll get even better results if the solutions added are at around 35 to 40 Deg C. The cake (collected solids) will drop cleanly from the filter cloth and there'll be no incremental clogging or blinding of the filter cloth like you'll find in drum filters or belt filters. With water based latex bound paint, there is no free lunch with regard to separating the solids from the liquid. Stay away from drum filters and belt filters. The mess will drive you nuts and you'll end up going postal on fellow co-workers due to the enormous maintenance requirements. good question, it has been a while since you asked about this, but anyway, I think you may also try chemicals for it. Not the answer you're looking for? Browse other questions tagged recycling building-materials diy manufacturing filtration or ask your own question. How to recycle paper with ink on it? How to sustainably deal with garbage?